Keeping animals healthy and at their proper weights provides enormous benefits. It certainly isn’t easy to weigh a temperamental animal without the proper equipment. But what is the proper equipment and how are you to know how well it will function in your environment without the test of time and experience? Well, that is our job. We guarantee that all of our industrial scales are built specifically for each environment in which they will be used. Scales built for animal breeders fall into a very specific niche and one that we feel we have mastered. Based on feedback from our clients and the expertise of our design engineers, our precision scales are unrivaled when it comes to the needs of animal breeders. Due to the unpredictable nature and movement of animals, we thought it imperative to provide certain indispensable characteristics for each of our animal scales. Our Combo Vet Scales sets are made to accommodate different sized animals. Our 320 Vet Scale can accommodate an animal up to five hundred pounds. This allows for larger animals to step onto the scale’s platform, which is sized twenty-two inches by forty-four inches. 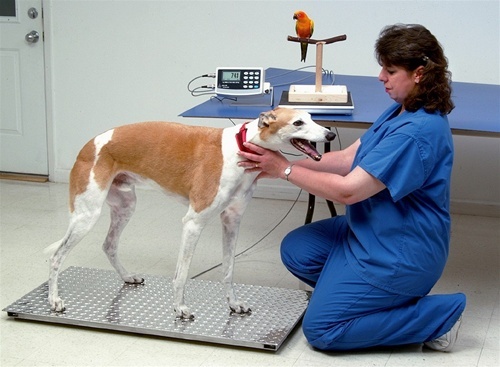 For smaller animals, such as reptiles and birds, which weigh less than fifty, twenty-five or ten pounds, the 620 Vet Scale’s platform size of twelve inches by sixteen inches is perfect. With the combo set you can chose your 320 Vet Platform size and the perfect 620 Vet Scale, use one scale indicator and save money. We use four heat-treated stainless steel load cells machine pocketed into a welded aluminum frame. These scales weigh around twenty-four pounds and come with a rubber mat. The weight resolution is .1 of a pound, which translates to an extremely accurate weight reading. Included is our Weight average and hold option for those restless sorts. This invaluable option will provide the relief knowing that despite the animals movement, getting an accurate reading is still possible. For dog, cat, bird and reptile breeders this set is a must. Incorporating elements into scales for larger animals such as llamas, alpaca and other livestock led us to design heavy-duty scales. The platforms are offered in twenty-two inches by forty-four inches and twenty-seven inches by sixty inches with a one and seven eighths of an inch profile. This low profile adds to the ease of use. Additionally, this scale weighs just sixty pounds for ease of portability. Because weather and temperature can be unpredictable in environments where these animals are kept, our scales are set to work in temperatures ranging from fourteen degrees to one hundred and four degrees Fahrenheit. We want our clients to keep their scales for many years to come, so we provide an overload warning at one hundred and two percent of the scaleÕs capacity and overload protection to one hundred and fifty percent capacity. The power voltage required for operation of these scales is 117VAC/ 50/60 Hz but if electricity is not available, we offer an optional battery pack comprised of six-cell rechargeable batteries that, when full, operate for twenty hours on a four-hour charge. These scales are built to endure sudden heavy movements. The heat-treated load cells are embedded in a welded frame for maximum durability and shock and overload damage. Because we use four load cells with exactly the same output values, there is no need for additional parts such as a summation board. Less is more when it comes to absolute precision. We also seal our load cells and the digital indicator to prevent moisture from leaking into and impacting the important parts of the scale. In fact, we are so certain of the durability of these scales that we offer a special three-year warranty. Now you know that our scales are manufactured with our best stainless steel load cells, placed in protective housing in a welded frame and composites from aluminum for portability and ease of cleaning. It is because of these high quality-manufacturing methods of the sub-assemblies and the scale’s construction, that this scale can produce the precise and accurate weight readings that it consistently does. The stainless steel inner components are not affected by changes in temperature, and are not easily impacted by sudden movements of the animals. They are specifically constructed to yield precise and accurate weight readings due to our Weight average and hold option. The animals you breed may be nervous or unhappy, yielding to the restriction of being held and may be moving to the point of distraction. This is to be expected but with this option, you are guaranteed a very accurate weight reading. Knowing the animals weight is valuable information in maintaining their well-being. Is he gaining enough weight? Is he healthy? If you breed pigs, our automated pig sorter, made from tubular stainless steel, is the perfect way to ensure the health of the herd. Placed inconspicuously between the housing and feeding pens, pigs must cross the scale’s platform when moving from one area to another, making it simple to get accurate weight measurements. Once the weight has been recorded, the sorter will automatically open the door into the proper feeding area based on the needs of the animal. Our livestock, alpaca and llama Scales, as well as our pig sorters, are available with a variety of options for data control. USB and Ethernet connectivity to your computer allows for accumulation of data that can be sorted and read with Microsoft Excel. For applications where computer use is not possible, one has the option of purchasing a USB Memory Stick for Data-logging. With this device, our clients can record weights along with time, data, group and animal information. The data is saved on a memory stick that can be removed at the day’s end and read on a personal computer using Microsoft Excel. As a breeder, you know the importance of monitoring and recording the weights of your animals. Their diets and health depends on it. Our team of knowledgeable sales associates is at the ready to guide you to the ultimate, cost effective, state of the art precision animal weighing scale that is perfectly suited to the animals you raise. For more information on animal scales, contact us today. Contact us here or by phone at (800) 645-4301.